A lovley pair of silver foil lampwork Murano glass bead earrings made in the traditional lampwork method by master artists in venice. 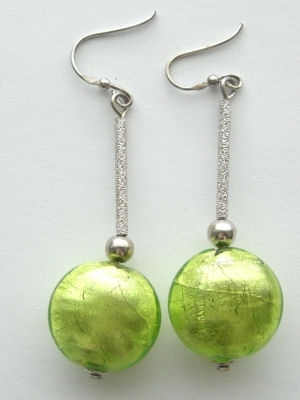 These earrings are made from hand made lampwork glass, in a lentil bead shape in a gorgeous vibrant lime green colour. They are set on sterling silver which is all sparkly and has a little sterling silver round bead to compliment the foil bead.